I know I've gushed about this series in the past, but I'm going to go ahead and reiterate one last time. 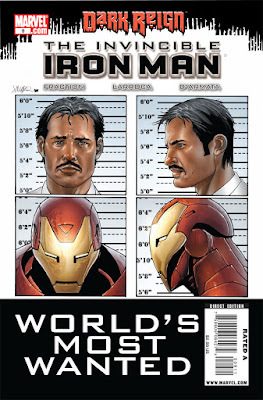 If you're not already reading Invincible Iron man, and you consider yourself a fan of the Marvel U, you owe it to yourself to start picking this one up on a monthly basis. Matt Fraction's writing for the series hasn't diminished in quality since issue #1. This month's edition continues the Dark Reign-centric arch that started last month. If the escalation in tensions between the general public and Tony Stark seemed dramatic last month, it doesn't even begin to describe how bad it gets in this issue. Stark takes some actions that firmly place him at the top of Osborn's to-kill list. What I especially like is how Fraction is bring together the characters of Stark and former S.H.I.E.L.D. commander Maria Hill. Like it or not, their destinies are intertwined at this point, and each is realizing how much they need the other's help if they plan to survive. I can't end this review without once again mentioning the art of Salvador Larroca. Not only does this guy continue to turn in some top notch art for this series, but dude also manages to provide a pretty cool cover to boot. Perhaps the best thing I can say about this series as a whole is that each month's story only makes me anticipate the next month's that much more. Go ahead, pick up a copy. I found this first issue of the new BPRD arch to be a little bit of a letdown after the explosive bombast of The Warning. 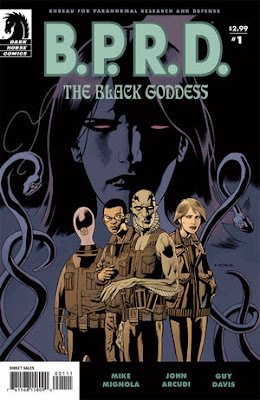 This newest storyline picks up essentially right where the previeous series left off, with the BPRD still actively searching for the whereabouts of Liz Sherman. Not a whole lot of progress is made on that front in this issue, but good old Lobster Johnson is brought back into the fold thanks to a bevy of flashbacks. It's hard to tell how all of the information presented in this issue will payoff, but that uncertainty makes the cliff-hanger ending one that is very unsatisfying. That being said, Mike Mignola and John Arcudi are not a writing team that dissapoints on a regular basis. The guys might be trying to take things a little slower for an issue or two, change up the mood a little. Guy Davis' art really gets a chance to shine among all the narration and exposition. I feel like I'm unfairly bashing a comic that tells a better story than most, but I really expect more from these guys. Fans, pick this one up and hope things get a little bit more up to speed next month. As frustrating as it was to have to wait to read this issue for so long, the experience of reading #10 and #11 back to back really heightened my enjoyment of this series. It's a great demonstration of just how versatile David Lapham can be with his writing. 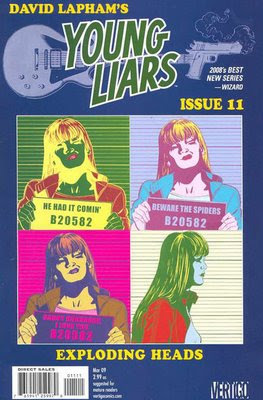 I'm pretty sure this issue is a precursor to the first issue, a flashback to happier times for the Liars. The focus of this issue is on the character of Big C, and explains the motives behind alot of her actions in previous issues. Here we learn about Big C's first botched pregnancy, and the amount of emtional trauma it caused her. Lapham really plays to the reader's emotions in this issue; it's not nearly a trippy or disjointed as recent issues have been. It fleshes out the character of Big C, while at the same time explaining the relationships she has with the rest of the Liars. After reading this issue, it's perfectly clear why Big C considers Sadie one her best freinds and Danny as one of her worst enemies. The last few pages are some gut-wrenching stuff, but Lapham handles it all very beautifully. 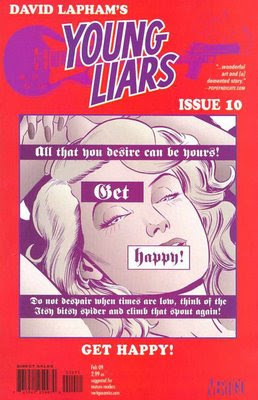 An issue like this shows the emotional range that the Young Liars series really possesses. I hope I'm not ruining too much by calling this issue aptly-titled, but the cover really says it all. This month's edition jumps straight back into the main storyline and brings the rest of the Liars gang back into the fold. Sadie finally gets her climactic showdown with her father, the reclusive owner of the Brown Bag Superstores. The way it all happens is just as crazy as anyone who has read previous issues would expect. I think my favorite scene was watching Donnie and Annie X toting M-16s, and running, guns-blazing, behind a determined Sadie. I won't ruin too much about this climactic event, suffice to say, Danny's feigned-obliviousness to the Sadie's past is fully exposed here, and in a rather shocking way. I can't wait to see where Lapham takes the story from here. Those of you looking to catch up with this amazing series should definitely get your hands on the recently released Young Liars Vol. 1: Daydream Believer TPB which collects issues #1-6 for the low price of 10 bucks.